Tema: The Beatles - Sgt. Pepper's Lonely Hearts Club Band. Ediciones 50 Aniversario. -Edición Deluxe de... ¡6 discos! -Nueva mezcla stereo de Giles Martin a partir de los masters originales. Este disco está incluido en todas las ediciones. 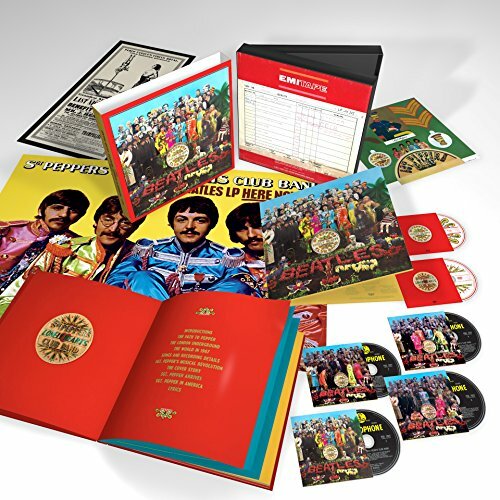 -Dos discos de outtakes de las sesiones, con más de 100 minutos, incluye remezcla stereo de Strawberry Fields Forever y Penny Lane. Uno de estos discos se incluye en la edición de 2 CD/ 2 vinilos. -El álbum original en mono con 6 extra tracks, incluyendo versión "perdida" de Lucy in the Sky with Diamonds. -DVD y Blu-ray que incluyen el documental "The making of Sgt. Pepper", mezcla en 5.1 del disco y la mezcla stereo en Hi-Res. -2 posters (uno es réplica del que publicó en 1967 el Club de Fans de los Beatles y el otro es una réplica del póster circense que inspiró a Lennon la canción "Being for the Benefit of Mr. Kite!"). MIK, Raulvz y Kubrick_91 han agradecido esto. Re: The Beatles - Sgt. Pepper's Lonely Hearts Club Band. Ediciones 50 Aniversario. fernando4499, MIK y Kubrick_91 han agradecido esto. Uff que buena pinta!!! Compra asegurada si o si. Empiezo a ahorrar desde ya para la edicion deluxe y los dos vinilos. 4. Being For The Benefit Of Mr. Kite! fernando4499, LEMOR y Kubrick_91 han agradecido esto. Yo me quedo con la versión en mono que era la que le gustaba a Lennon. Es que la versión en mono es en la que trabajaron los Beatles, en la stereo original faltan cosas como el acelerado de She's Leaving Home o la alteración de la voz de Lennon en Lucy. Pero lo interesante de la remezcla es que Giles Martin dice que se ha inspirado en la mezcla en mono, ha aplicado todos esos elementos y el concepto general del sonido, así que va a ser interesante de escuchar. Si al final no nos gusta, siempre nos quedará la mazcla mono original (que también se incluye en el pack). Any visit to Abbey Road Studios is incredible, but to be in Studio 2, where the Fab Four recorded most of Sgt. Pepper, for this playback event was pretty special. After a short introduction by Apple boss Jeff Jones, George’s son Giles Martin (who with Sam Okell remixed the tracks for the forthcoming reissue) was interviewed by BBC 6 Music broadcaster (and former Menswear drummer) Matt Everitt. Giles Martin: Music’s a strange thing. You try to recreate, what you remember hearing, if that makes any sense? So the goal behind Sgt. Pepper is to say… ‘What does Sgt. Pepper sound like? We have the privilege of going back to the four-tracks… we can peel back the layers and rebuild it. So the goal.. well there’s two things. There’s the ‘socks and sandals’ brigade – they own every single note of Sgt. Pepper. There’s probably some people in the audience who would claim to be these people – and they are – they are the people I lean on. And then there’s the children and grandchildren of people who are told ‘you should listen to Sgt. 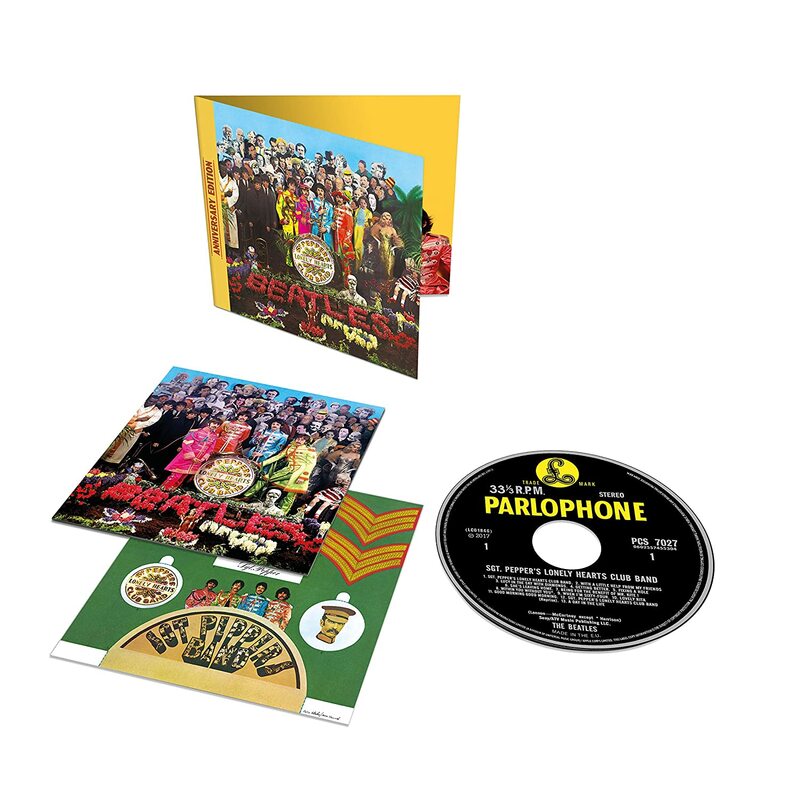 Pepper – it’s the most amazing sounding album’ and they can put it on in this crazy world we live in, with all the other music in the world and it bursts out of the speakers as it should do. So that’s the intention, to tick both of those boxes. Giles Martin: The Beatles weren’t present for the [original] stereo mixes at all. The monos were to the band what Sgt. Pepper is. What happened is, when The Beatles recorded they’d make notes on the tape boxes, [but] because the speed and pressure with which they were working… for example, before they finished the mixing – I think – they recorded Magical Mystery Tour, the song, and they recorded the All You Need Is Love broadcast as Pepper was coming out… so things like paying attention to notes on recordings just weren’t done. Our intention was to make a stereo of the mono. I worked with my dad since I was 15, so I know what he would have thought and I know the band well, so you just kind of respect what they think. Giles Martin: My first Beatles exposure was on the Anthology project, I was 21, 22, and I went upstairs with my dad and he played me A Day In The Life from the four-track, and it was like they were in the room. The clarity, the tapes… we get credit for this, stuff they did years ago, but the tapes sound amazing. The Beatles don’t sound old and their records shouldn’t sound old. I’ll give you an example of what we can do by not using the bounces… so if you can imagine, if you record guitar, bass and drums and you bounce that down to one track… so [in stereo] you end up with music on one side and voice of the other.. So if you take Lovely Rita, the CD you all know is very heavily biased on the right hand side [plays a section of the original stereo song followed by some of the new stereo mix which is much more balanced]. In essence, what we do is peel back the layers… immersive is such an overused word for albums now, but Sgt. Pepper really is an album you can fall into… the mono of Sgt. Pepper is so technically brilliant. Giles Martin: We wouldn’t be here listening to this now if they [Paul, Ringo, Olivia & Yoko] weren’t happy. It’s their record. I’ll play you Lucy In The Sky With Diamonds. The mono has a lot of ADTing which where you varispeed the tape machine and with the record head and play head at the same time, it gives you this voice effect… This is what John Lennon wanted [plays some of the original mono mix.. followed by the new stereo mix, which has all the correct vocal effects in place]. Again, it’s a stereo of the mono. Giles Martin: [This new mix is] about bringing them into the room, because they were so good. They made such a good noise. There’s very few things in life that make you feel better – especially right now – that just exist. And this is one of those things…. It’s the opposite of ice-cream brain freeze, this record. You know, why have When I’m Sixty Four after Within You Without You? There’s so much innovation and ideas packed into it. I found while working on it – we didn’t mix in order, we just chose a song and mixed it – that it’s only as we put it together you realise that as an album the songs make more sense. Giles Martin: We were quite conservative with the 5.1 mixes on the ‘number ones’ album but with this the 5.1 mixes are much more immersive. Question from SDE: Was Carnival of Light considered for the bonus material in the box? Giles Martin: Yes, it was. As was It’s Only A Northern Song, as well, actually. But it wasn’t really part of Pepper. It wasn’t part of the Sgt. Pepper recording. It’s a very different thing. I hope we can do something interesting with that at some point…but it wasn’t really part of the Sgt. Pepper album. Giles Martin: Did I reference the Quad Mix of Sgt. Pepper while making the new 5.1? No, I didn’t, is the answer! It wasn’t done by The Beatles… was it? Again, I go back to what they did and what they think. So no, I didn’t. Nor did I know that it existed, so that’s probably why [laughs]. What’s left that hasn’t been heard? During the evening, the new stereo mix of Sgt. Pepper’s Hearts Club Band was played in full. This was being driven directly via 96/24 files from Giles Martin’s laptop, to what are presumably hideously expensive speakers (see image above). So how does it sound? It’s a difficult question to answer accurately since ANY version of Sgt. Pepper being blasted in Studio 2 of Abbey Road Studios would sound amazing and it’s very, VERY easy to get sucked into just enjoying the record and forget to listen out for tell-tale improvements (or otherwise). And you can’t say “stop, can I hear that bit again?”. That said, I thought Giles and Sam had done a great job and the best indications were earlier in the evening when Martin compared tracks side-by-side (Lovely Rita, Lucy In The Sky With Diamonds). The goal – as stated – was to “make a stereo of the mono” and from what I heard, they seem to have fixed many/all of the limitations and/or mixing errors on the original stereo version. The new stereo remix is unquestionable superior to the original stereo mix. Whether that renders the original mono mix semi-redundant, is another, more interesting question. Giles talks about ‘peeling back the layers’ but when you unglue everything in the original mixes in a digital domain and then try to ‘reseal’ for a 2017 remix do you lose something intangible? Does the dust in the air of 1967’s Abbey Road Studio 2 leave the room? The positives are numerous, such as clarity, separation and depth of bass and drums in particular. But whether by accident or design recording Sgt. Pepper on a four-track and ‘bouncing down’ meant compromising on clarity and separation and the question is, do those compromises detract from or add to the magic of the album? Maybe it’s a moot point. The original mono album endures and indeed has a place at the table within the new super deluxe edition box set, although it’s worth noting, for all its accepted superiority, that Apple have never made it available separately on CD. I guess the nuances are too hard to communicate to a general audience. Why would I want to listen to something in mono?! Technological advances have allowed Giles Martin to create a stereo mix his father simply couldn’t do in the 1960s, and I can see this new remix fairly quickly superseding the flawed original. As Giles pertinently pointed out, our children and grandchildren have a version of the album that ‘works’ in this new millennium and also honours the original mixing decisions of the mono version. Crucially, this means the general audience will now be listening to a mix of the album that is close to what the band wanted when they oversaw those mono mixing sessions. But that’s the general audience. I suspect purists will still gravitate to the ‘unpeeled’ mono version for the ultimate mix of authenticity and (in Giles’ own words) technical brilliance. Marty_McFly, LEMOR y MIK han agradecido esto. Tanta restauración y remasterización se van a cargar el sonido original, la esencia de ese sonido de los 60 con los defectos y virtudes que tiene. Dejadlo ya. Todo esto es para sacar pasta al consumidor. Y dejar a la gallina sin huevos literalmente. Este Sargento Pepper se podrá oir de puta madre, pero no es el Sargento que grabó Paul, John, Ringo y George...no lo es. Hombre, precisamente la restauración y remasterización (si se hace bien) lo que hace es revelar mucho más la música que está en las cintas originales (y que las limitaciones técnicas de la época no podían representar en su totalidad). Y claro, se trata de sacar pasta, como se trataba de sacar pasta cuando salió el disco original en 1967. No hay nada de malo en ello: que lo compre quien quiera. Y en cuanto al Sgt. Pepper que grabaron los Beatles: probablemente nos podremos acercar más que nunca al sonido que escuchaban ellos en el estudio. Y para quien prefiera el sonido de los discos originales, los tiene ya en todo tipo de configuraciones, y no van a desaparecer por esta nueva versión. ¿Qué sentido tendría sacar otra vez lo mismo? b) QUe los mas fans se pongan nerviosos porque no tienen esa nueva versión que "dicien" que es la mejor hasta ahora. Que hicieron en la primera, segunda y tercera remasterización, hacerlo mal? Antes que nada, gracias por tus palabras. Respecto al tema en sí, vuelvo a leer el mensaje del compañero y lo que veo es que se está quejando de que el sonido no se parezca al original. Y sigo pensando lo mismo: no tiene que sonar igual. El sonido de los vinilos en los 60 estaba limitado para reproducir lo que había en las cintas originales (poca gente sabe que en EMI probaban los discos en un tocadiscos barato de la época: si el disco saltaba por exceso de graves, se recortaban frecuencias por abajo, si distorsionaba, se recortaban por arriba). 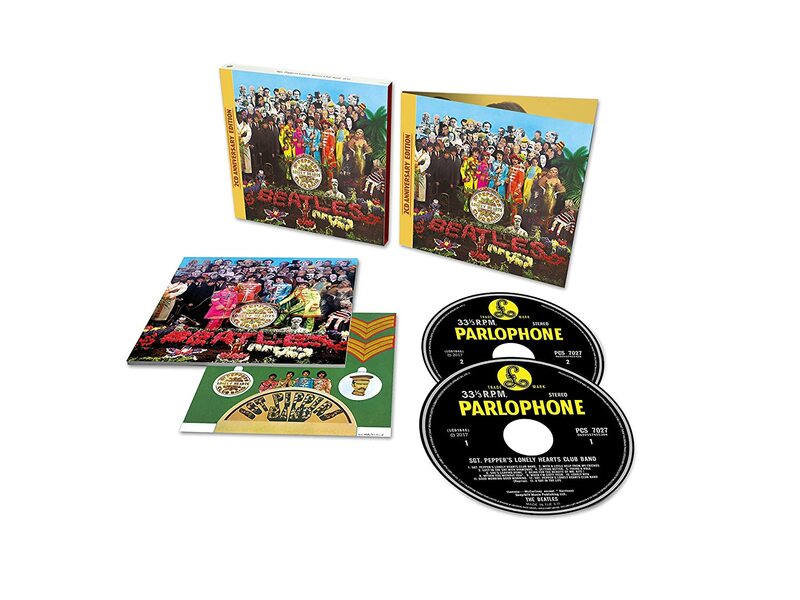 La nostalgia está muy bien y es muy lícita, pero técnicamente ahora (se puede comprobar en la remasterización de 2009 en CD y vinilo) se puede mostrar mucho más fielmente lo que los Beatles grabaron en las cintas originales. Mucha gente se sorprendió por lo contundente del sonido del bajo y los graves en los discos remasterizados. Ese sonido siempre estuvo en las cintas originales, simplemente los vinilos de la época no lo mostraron por las limitaciones técnicas. Y en lo que tú dices, sinceramente creo que se podrá decir de muchas bandas, pero no de los Beatles: estuvimos con aquellos primitivos CDs de los 80 (muy discretitos técnicamente) durante 22 años!! Mientras los Rolling Stones, los Doors y otros grupos llevaban ya 3 remasterizaciones y algunas remezclas, los Beatles no remasterizaron su discografía hasta 2009, y esa es la versión oficial actual. Y realmente son las mismas mezclas en mono y stereo de los 60, simplemente el sonido es mejor como es lógico en cualquier remasterización. No hay 4 versiones de lo mismo, la discografía sigue siendo la misma. Ahora se remezcla por primera vez un disco Beatle, el Sgt. Pepper por el 50 aniversario, es una cosa puntual y especial, no sé por qué va a confundir a la gente, y menos a los fans. Yo opino que cuanto más haya para elegir, mejor. ¿Que a uno le gusta el sonido de los vinilos de los 60? Pues no se van a esfumar de su estantería porque editen esto. ¿Que prefiere el CD de los 80 o la remasterización de 2009? Pues lo mismo, ahí estarán para siempre. Nadie obliga a comprar la nueva edición. Y repito, los Beatles no han remasterizado, remezclado o expandido sus discos cada 5 años como hacen otras bandas. No entiendo la queja. Y ahora van a sacar nuevas masterizaciones entiendo? A ver si no me he enterado. Y no, ahora no van a sacar nuevas masterizaciones, es una edición especial de Sgt. Pepper, la primera de un disco de los Beatles. Cuenta cuántas hay de discos famosos de otros artistas. davimo y MIK han agradecido esto. 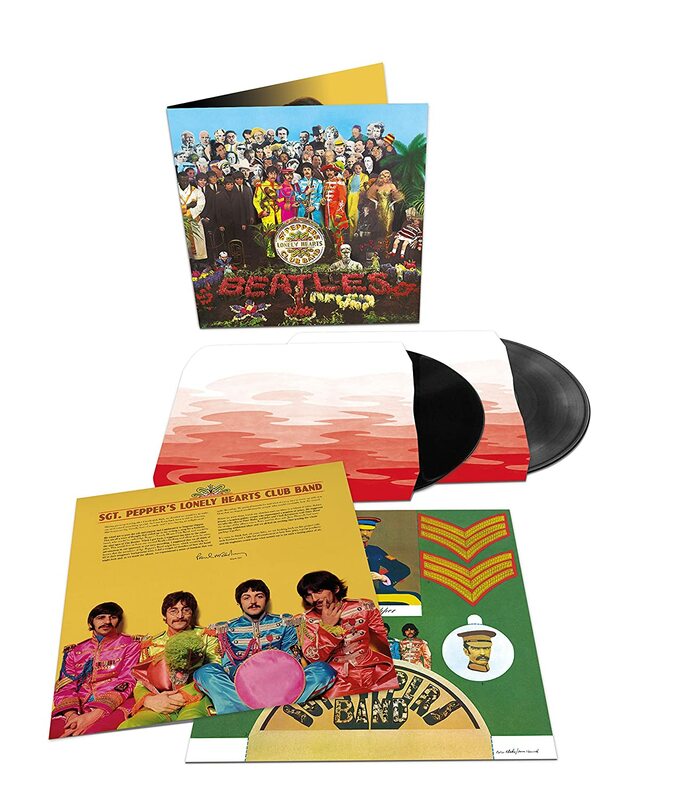 El hecho diferencial de esta edición aniversario del Sgt Peppers es que no es una simple remasterización, sino una nueva mezcla (remix) de las pistas de sonido, con lo cual el "paisaje sonoro" será totalmente nuevo. Mas merchandising, toca exprimir la gallina, me sigo quedando con la edición mono y su fabuloso sonido. En efecto, la versión en mono es la mejor hasta ahora, pero ¿acaso has oído la nueva mezcla en stereo? Yo es que no opino de algo hasta que no lo escucho. Es que la versión mono fue tal y como se concibió el disco. Aqui hay un articulo, de los muchos escritos, donde se defiende la version mono. El nuevo lanzamiento me parece bien, es una forma de preservar el disco. Y si este nuevo sonido estereo se oye bien pues genial. Y quien lo compre me merece todo el respeto. Pero la versión mono será la autentica, la original y la unica. Es que la mezcla mono es la versión de la banda de este disco, así que nada le va a quitar ese puesto, y menos ahora que está reeditada en CD y vinilo. Peor estábamos en los casi 40 años en los que la única versión disponible era la chapucerilla mezcla stereo de los 60 (en la que los Beatles no participaron, y en la que faltan efectos sonoros y modificaciones que la banda puso en mono). Lo interesante de la remezcla es que Giles Martin se ha basado en las decisiones tomadas por los Beatles y su padre en la mezcla mono, esa ha sido la guía. Es decir, She's Leaving Home tendrá el acelerado que Paul McCartney aplicó (y que en el stereo original se olvidaron de añadir, con lo que suena más lenta), el efecto phasing estará en la voz de John en Lucy in the Sky with Diamonds, el balance de isntrumentos se basará en como lo hicieron en mono... Simplemente con el más amplio espectro sonoro del stereo. Y en cualquier caso, en el pack viene la mezcla mono, así que se la sigue reconociendo como la versión definitiva, no porque los Beatles fueran puristas del mono, simplemente porque era el formato rey en aquella época. Lógicamente si se hubiera hecho un par de años después, lo habrían hecho en stereo (Abbey Road, por ejemplo, ya no tuvo mezcla mono). fernando4499 y MIK han agradecido esto. ¿Crees que sonara muy diferente a las publicadas por ahora? Quizás nos encontremos con la panacea de las ediciones del sargento pimienta. La panacea no sé, pero que va a ser diferente, seguro. Ten en cuenta que hasta ahora siempre hemos escuchado las mezclas originales de los 60 (mono y stereo). Pueden sonar mejor o peor en vinilo o CD, remasterizadas o no, pero era exactamente lo mismo (los instrumentos distribuidos igual, los efectos sonoros y aditivos, los niveles relativos entre cada uno, el balance...). Por primera vez se remezcla un disco de los Beatles, de modo que sí, va a ser diferente. O no tanto, porque ya digo que la guía ha sido la mezcla mono original, pero aplicada al stereo. Si Giles Martin ha acertado tendríamos la integridad artística de la mezcla mono y a la vez la amplitud sonora del stereo. Ya veremos cuál es el resultado. MIK y zinerman han agradecido esto. Como bien dice Juan Miguel, Harrison y Lennon prefirieron la toma mono y George Martin la plasmo tal y como ellos deseaban ¿que nos hace pensar que Giles (supongo que es el hijo de Martin) va a dar nuevos aires a un disco ya de por si antológico? ¿Que sera lo próximo, nuevas mezclas para el Blonde on Blonde de Dylan o el Nebraska de Springsteen tocado con la banda de la calle E? ¿Cuándo celebren el 60 aniversario, por donde irán los tiros? por que esta claro que habrá nueva versión. No es que me parezca mal, pero esta claro que la oportunidad la pintan calva con fecha tan señalada. Que los bolsillos de Maca y de Ringo lo van a agradecer, también. Esto no quiere decir que no acuda a mi Supermarket chino a por una copia para ver como ha quedao el engendro. Pero esta claro que después de agenciarme la Box japo de la versión mono, no paso mas por caja. ¿Por qué mencionas sólo a Harrison y Lennon? Los cuatro Beatles trabajaron la mezcla en mono, mientras que ninguno de ellos acudió a la mezcla en stereo, que no tiene nada de antológica. Ya digo, el pack incluye el disco en mono, reconociendo su carácter de versión oficial de la banda. Pero hacer una remezcla en stereo no va a hacer que los discos se evaporen. No entiendo ese discurso. Los Beatles no hicieron su Sgt. Pepper stereo, ¿qué problema hay en que se haga uno que precisamente incluya todos los matices que los Beatles metieron en la mono? No la hubo en el 10 aniversario, ni en el 20, ni en el 30 ni el 40. Que os equivocáis de banda, que la discografía de los Beatles no está tan ordeñada como la de otros. ¿Y qué? Por mí que ganen todo el dinero del mundo, me hacen felices con la música que crearon. Tiene gracia, en foros de música los fans de los Beatles se estaban quejando a principios de año porque decían que Apple no iba a hacer nada por el 50 aniversario. Se anuncia una increíble edición especial y ahora salen otros tanto quejándose no se sabe bien por qué, porque si no interesa algo basta con no comprarlo. Parece que nunca llueve a gusto de todos. Por mi parte yo estoy abierto a escuchar, no sólo la remezcla (en stereo y en 5.1 además), sino todas las out-takes que nos van a dar una visión de la creación de Pepper increíble. Si después no me gusta la nueva mezcla, no hay problema, sigo teniendo las mono y stereo originales. En mi opinion esta genial este pack deluxe, la remezcla va a ser una gozada, solo como suene como la soundtrack de yellow submarine yo estare encantado. Por mi parte es compra segura. Yo tengo todas las versiones, tanto en mono y en stereo, en cd, en LP, incluso tengo una version del LP mono britanico, y me parece genial que saquen esto, a mi me hace feliz y me ilusiona escuchar la nueva remezcla. La original es la version mono, pues si me apetece escucharla asi, me pongo el album, pero otro dia me puede apetecer escucharlo en 5.1, y sera una gozada tambien. Ojala lo hicieran con toda su discografia, yo me pongo en la cola para comprar todo lo que saquen, y si mccartney gana dinero, pues mejor para el, se lo merece, a mi me hace feliz.